S&A small water chiller CWFL-800, specially designed for cooling 800W fiber laser, has superior & efficient cooling performance. It is produced by Guangzhou Teyu Electromechanical Co., Ltd (also known as S&A chiller), a professional Chinese water chiller manufacturer with 16-year experience. 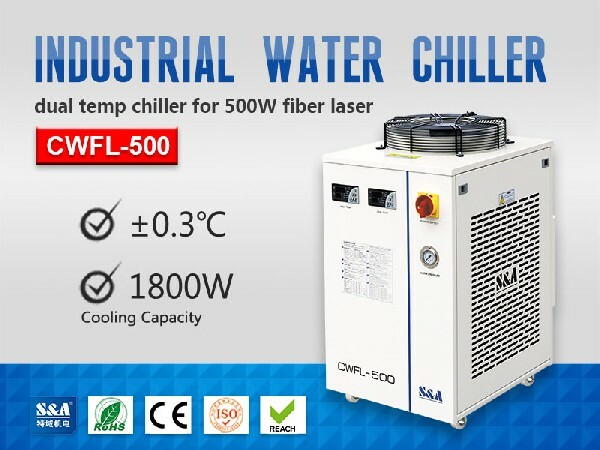 S&A water chiller machine CWFL-500, specially designed for cooling 500W fiber laser, is a cooling device with superior performance. It is produced by Guangzhou Teyu Electromechanical Co., Ltd (also known as S&A chiller), a professional Chinese water chiller manufacturer with 16-year experience. S&A water chiller unit CWUL-10, specially designed for 10W-15W UV laser, is a highly efficient refrigeration type cooling device. 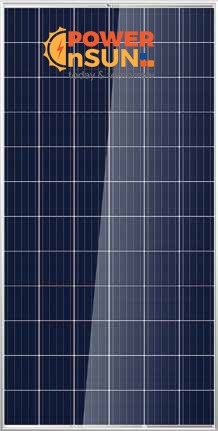 It is produced by Guangzhou Teyu Electromechanical Co., Ltd (also known as S&A chiller), a professional Chinese industrial chiller manufacturer with 16-year experience. 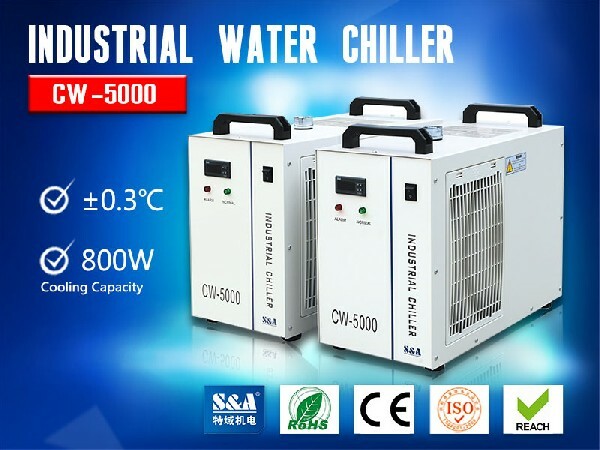 S&A air-cooled water chiller CW-5000 is a professional refrigeration type cooling device, which is widely used in cooling 100W CO2 laser, 300W-600W UV LED and 5KW spindle. It is produced by Guangzhou Teyu Electromechanical Co., Ltd (also known as S&A chiller), a professional Chinese industrial chiller manufacturer with 16-year experience. 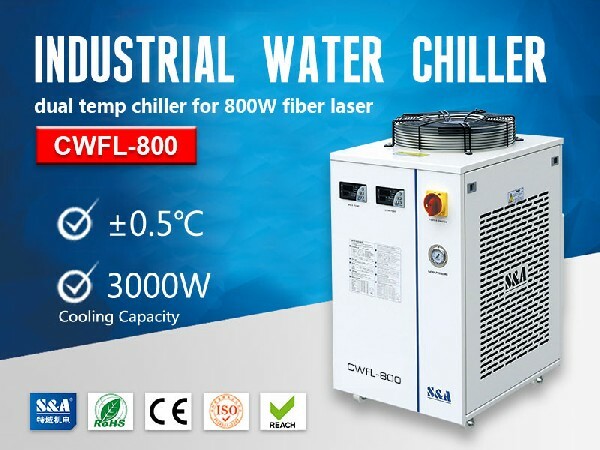 S&A air-cooled water chiller CW-5000 covers 50% market share of CO2 laser refrigeration market due to its superior cooling performance, precise temperature control, compact design and ease of use. It ranks the highest sales volume among all S&A refrigeration type water chillers and it is very popular in Europe, South America, Asia and other markets. 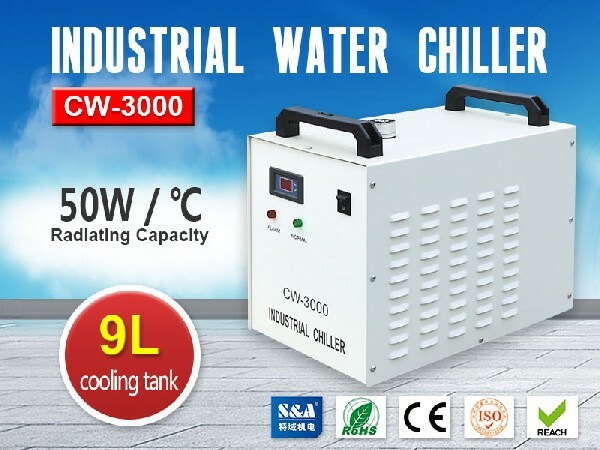 Characterized by the cooling capacity of 800W and temperature control accuracy of �0.3℃, S&A industrial chiller CW-5000 can bring down the temperature of the equipment very efficiently, greatly improve the working life and ensure the stable performance of the equipment. S&A industrial water chiller CW-3000 is thermolysis type professional cooling machine, suitable for cooling machine with small heat load. It is produced by Guangzhou Teyu Electromechanical Co., Ltd (also known as S&A chiller), a professional Chinese water chiller manufacturer with 16-year experience. 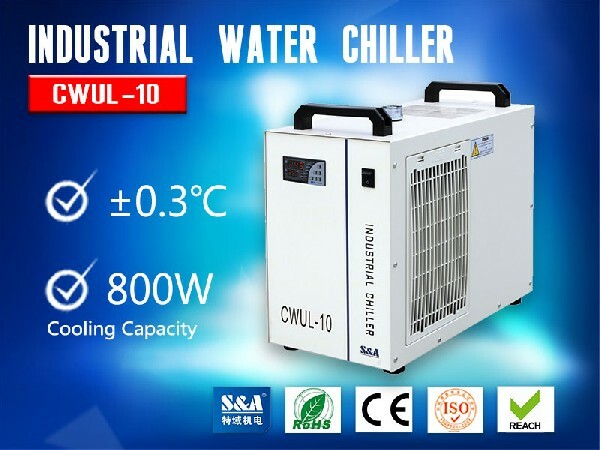 S&A industrial water chiller CW-3000 has multiple power specifications and has got CE,RoHS and REACH approval, which makes it more available in the international trade. It is very popular in Europe, South America, Asia and other markets. With the water flow alarm and the ultrahigh temperature alarm, S&A industrial water chiller CW-3000 can be well protected. Note: Since it is a thermolysis type water chiller, its water temperature can’t be controlled and is related to the ambient temperature. Purified water or clean distilled water is suggested to be used as circulating water of S&A portable water chiller CW-3000. Warranty is 2 year.